The first blog post of 2018 is a lot of pressure. I want to start our year out on the highest note possible, and was contemplating what that would look like. 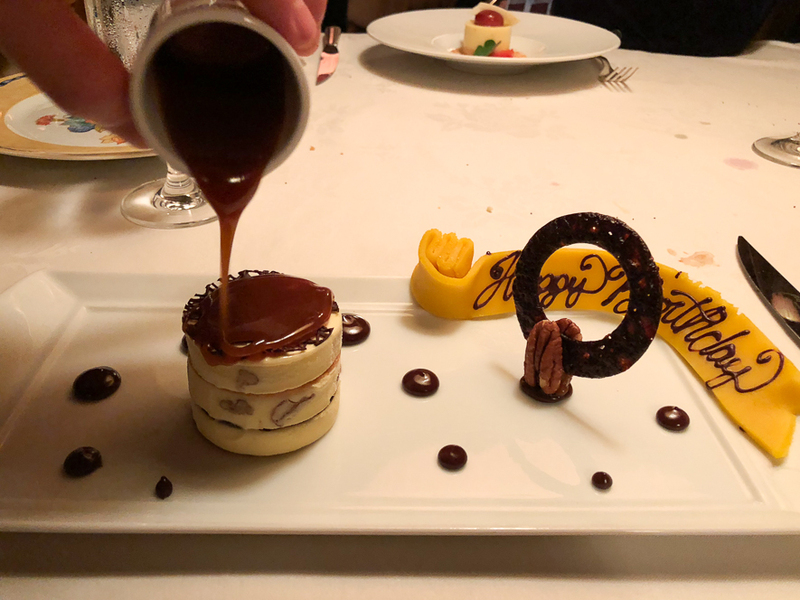 I had an internal debate about whether it should be a ridiculously good French onion soup recipe (coming next week), maybe a chocolate cake I make at every opportunity, or potentially a review of the best restaurant I’ve been to in all of my 24 years. I think you can guess by the title which one I chose. 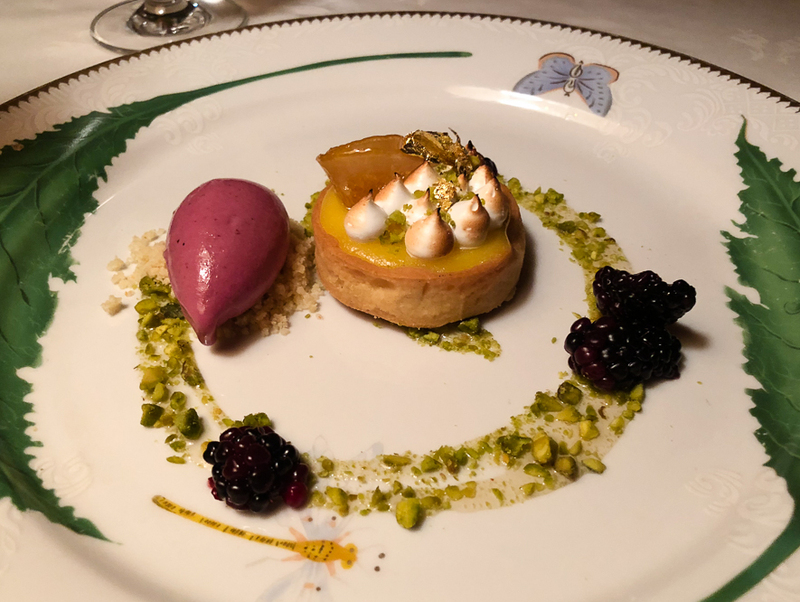 It’s embarrassingly late considering we dined at the Inn at Little Washington on Christmas Eve, but nonetheless I have to share this with you all. Calling The Inn at Little Washington a “restaurant” would be like calling Oprah ‘cool’. It’s the understatement of the year. 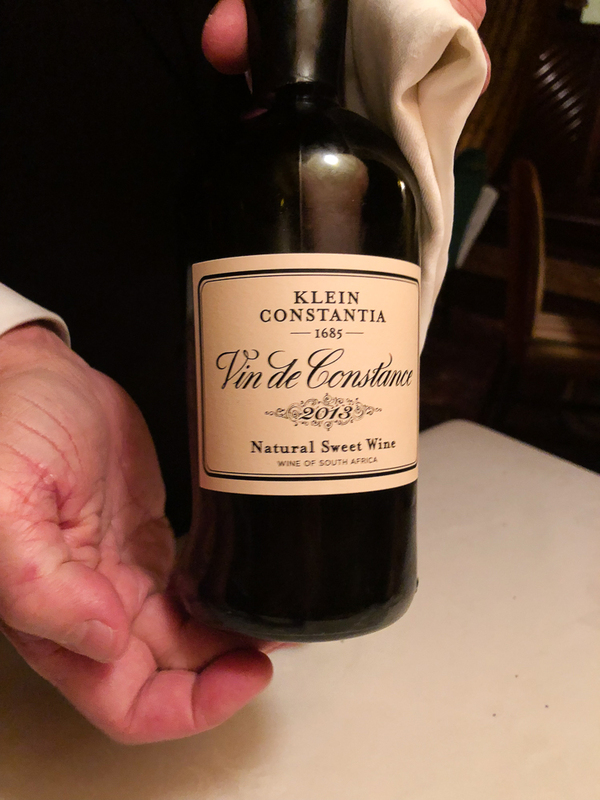 The Inn is an entire experience; like dinner and a movie at the highest possible level. Is it expensive? Absolutely? Is it far from DC? You bet. But in a way, the 90 minute drive gives you time to fully prepare yourself for the experience. The first step? Very stretchy clothing. A big part of me doesn’t want to spoil the surprises and the experience in case you go, but another part of me feels like if this post convinces one person to dine there, my work on this planet is done. Let me start out by saying they think of every. possible. detail. 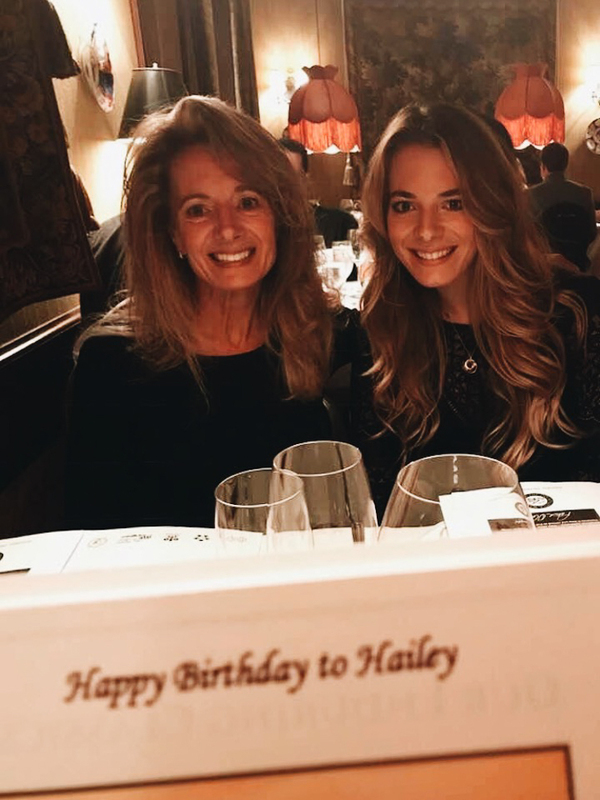 Since we went for my belated birthday dinner, they had customized menus waiting at the table for us. They even brought over a signed copy of their cookbook that my brother had called in! 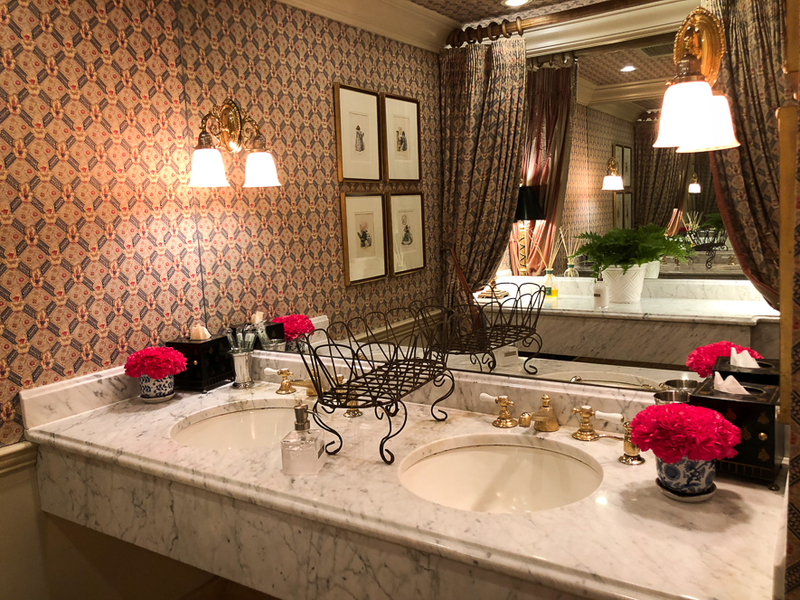 The decor everywhere is so unique as well. When you pull up to the restaurant in the sleepy town of Little Washington, it feels like you’re at your best friends grandma’s house: unfamiliar, but somehow still comforting. 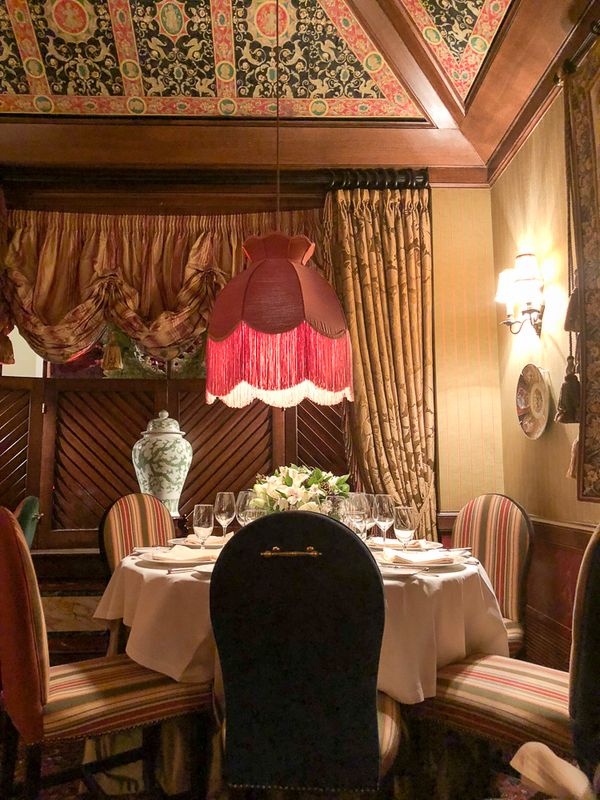 The restaurant is decorated differently in every room, but maintains an eclectic and warm style throughout. While I’m all about a good episode of Fixer Upper and talking farmhouse home style, let’s be real. We all know what I really came here for (the food). The way the 4 course menu works is you have a few different menus to choose from: The Classics, Here and Now, and a Vegetarian menu option. 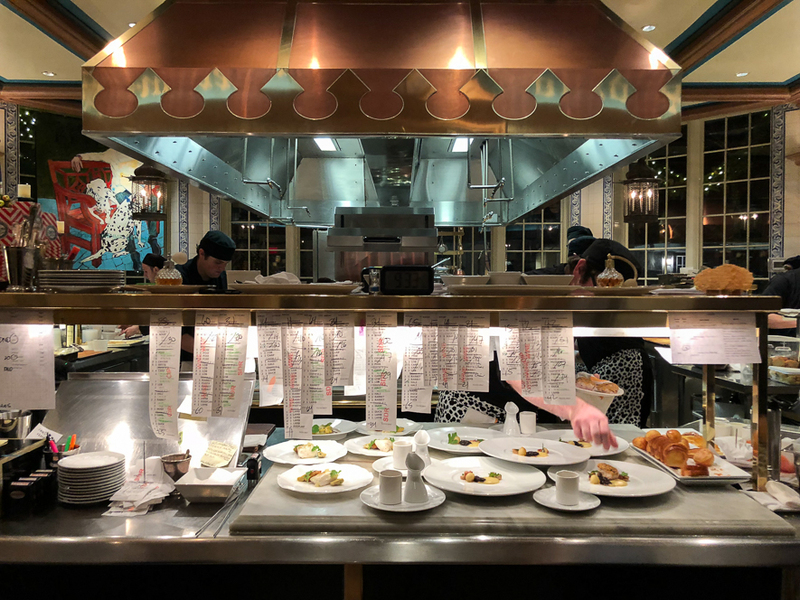 You can mix and match courses from each menu, and they’re incredibly accommodating to substitutions. However, before your 4 courses even begin, you’re greeted with the most creative amuse bouches. The first one is a tiny potato chip, rolled into a cylinder, and filled with pimento cheese. Creamy, crunchy, and savory, I wanted an entire bag full. 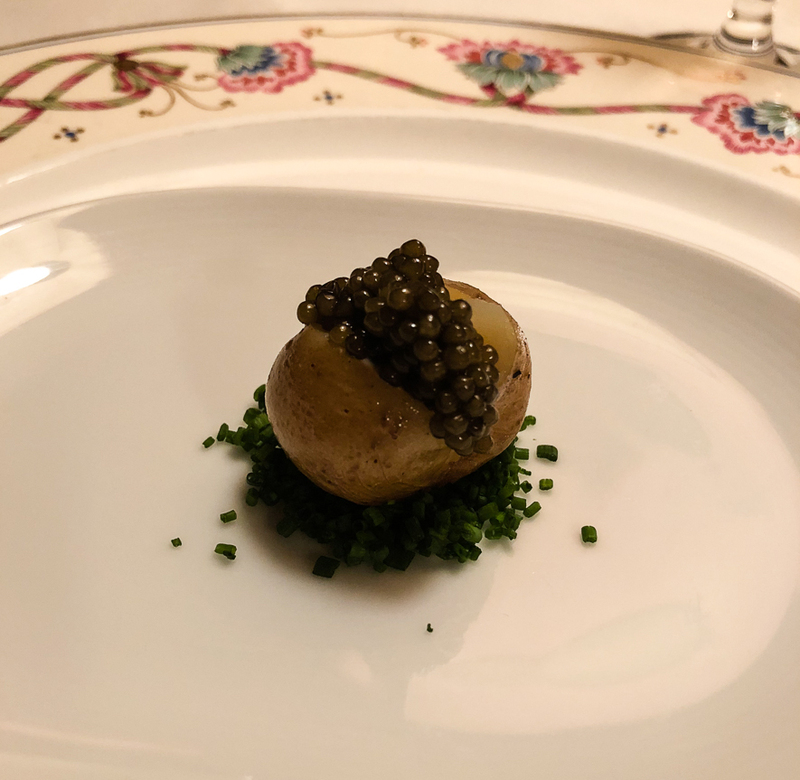 The second was “World’s Smallest Baked Potato”, perfectly roasted and topped with caviar. 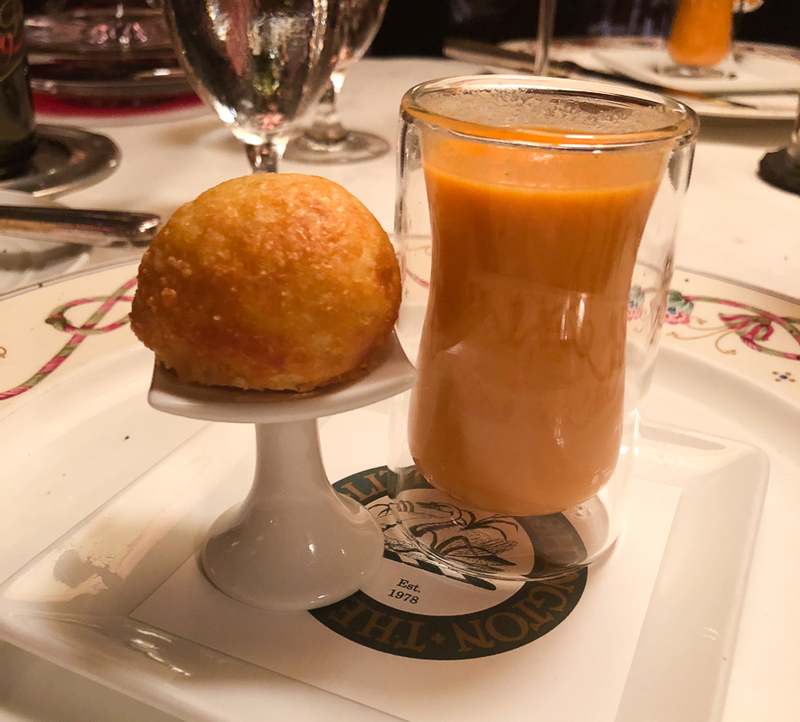 The final one was a glass of roasted red pepper soup with a cheese gougere. The soup came out piping hot and spiked with licorice liquor, and the gougere was like cheese in pastry form. I’ll never be able to eat Panera’s tomato soup again….. 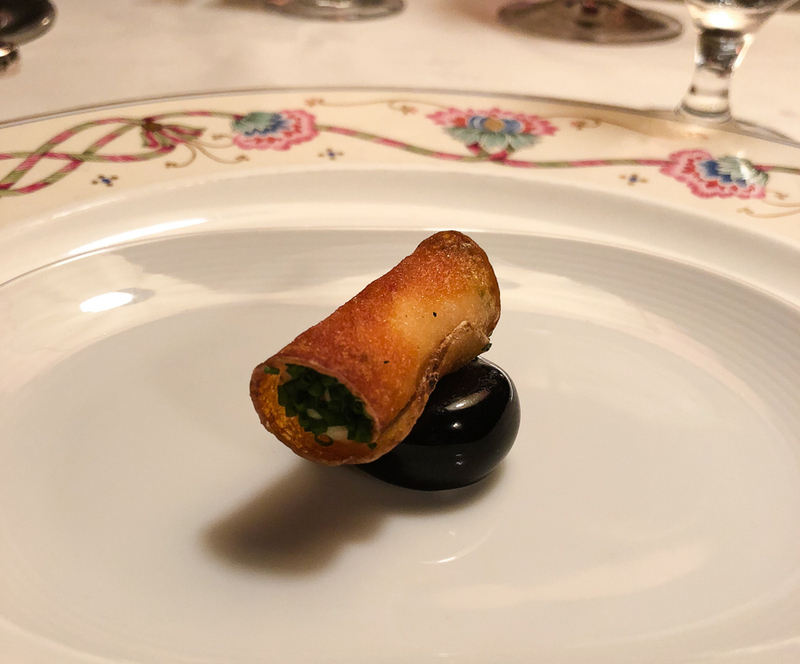 The amuse bouches set a crazy high bar for the rest of the meal, and I was worried it was only going to be downhill from there. 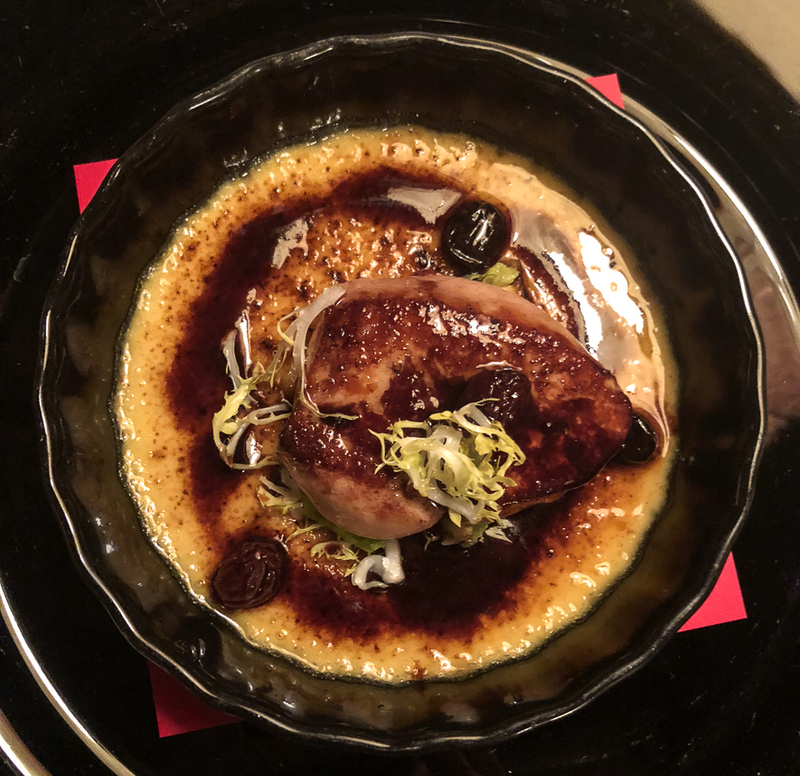 Thankfully I was so wrong, and was greeted next by small dish of custard topped with seared foie gras and port soaked raisins. It was the most unctuous (learned that word from Chopped), creamy, sweet, and rich dish I’ve ever had. 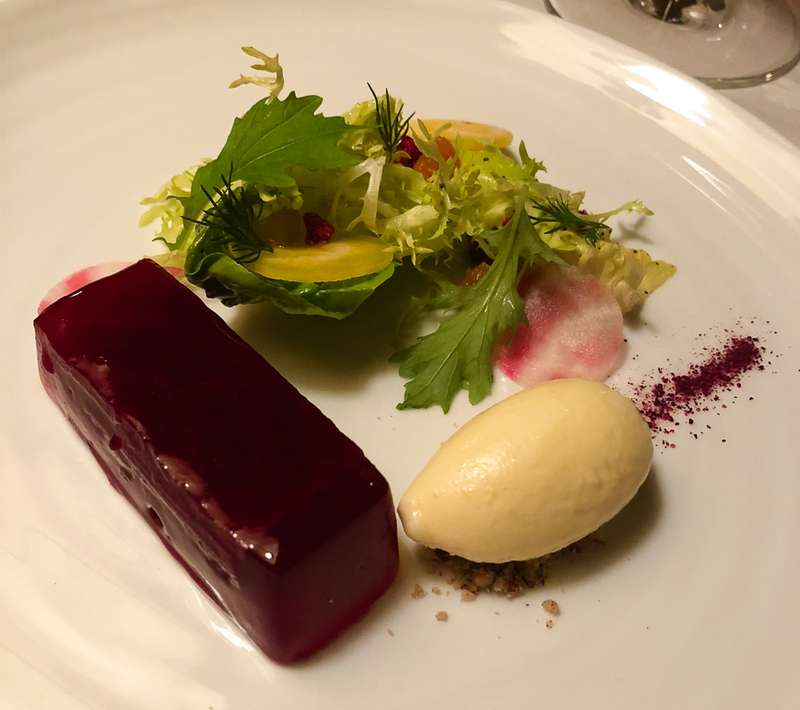 Just a few bites was enough to veer into potential heart attack territory, so I stole some of my Mom’s red velvet beet terrine with horseradish ice cream to lighten things up. The next course was one of their most famous due to the Caeser salad ice cream it’s served with. 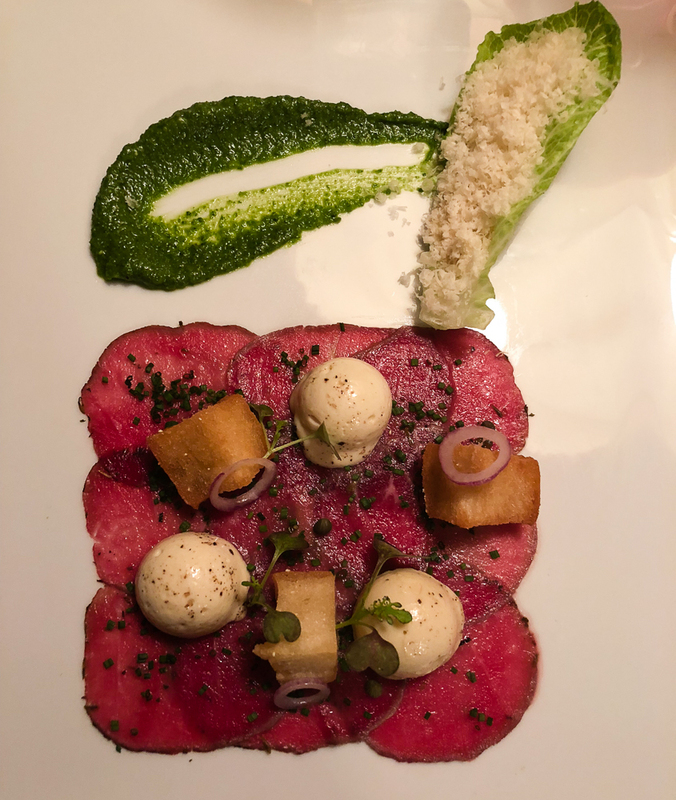 It’s an herb crusted lamb carpaccio with a scoop of the savory ice cream and buttery croutons. I’m usually not much of a raw meat person, but this paper thin lamb was so tender and flavorful and paired well with the creamy Caeser salad ice cream. 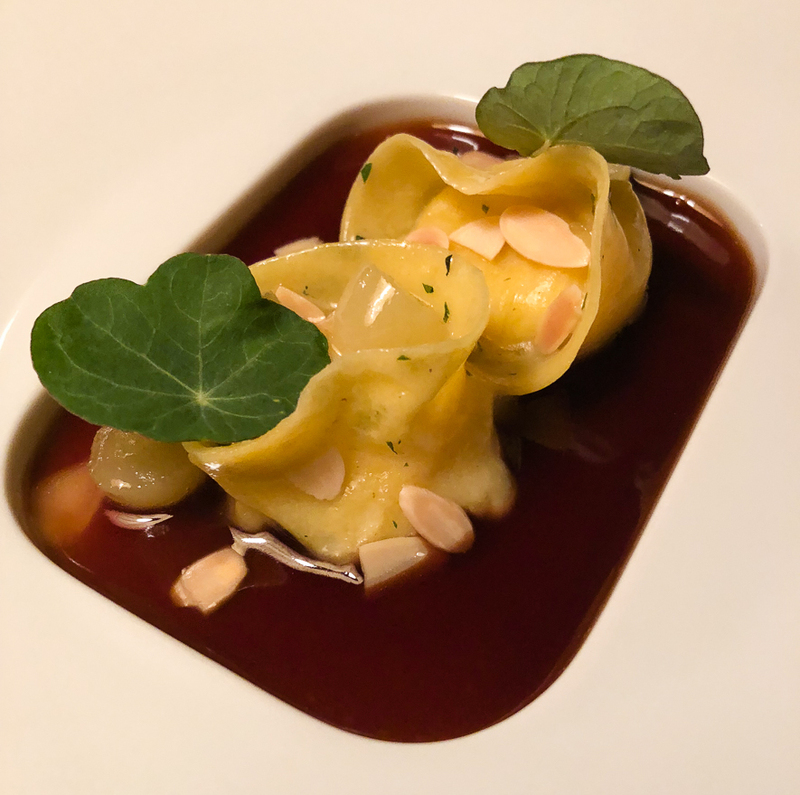 My mom continued down the vegetarian route and got the brie tortellini, that was filled with a chunk of melted cheese atop a roasted fig sauce and toasted almonds. 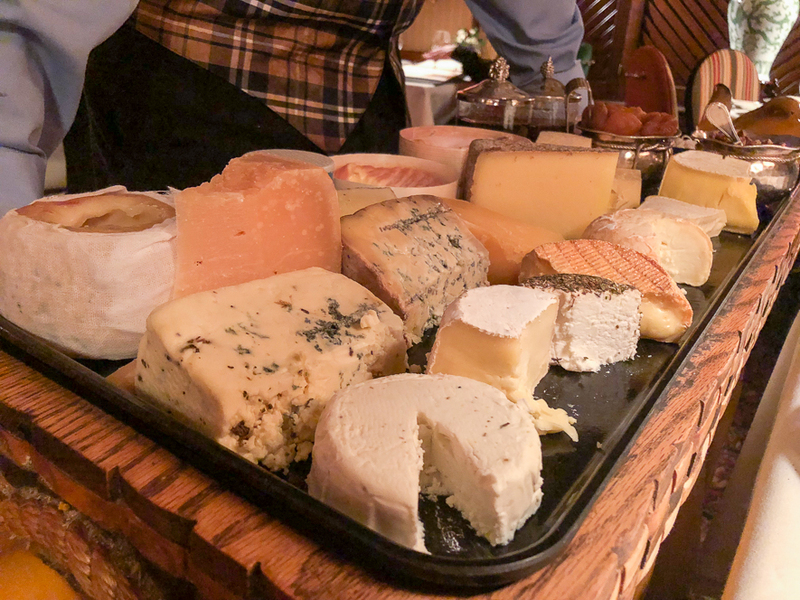 It was like the best parts of a cheese plate but in pasta form. Genius. 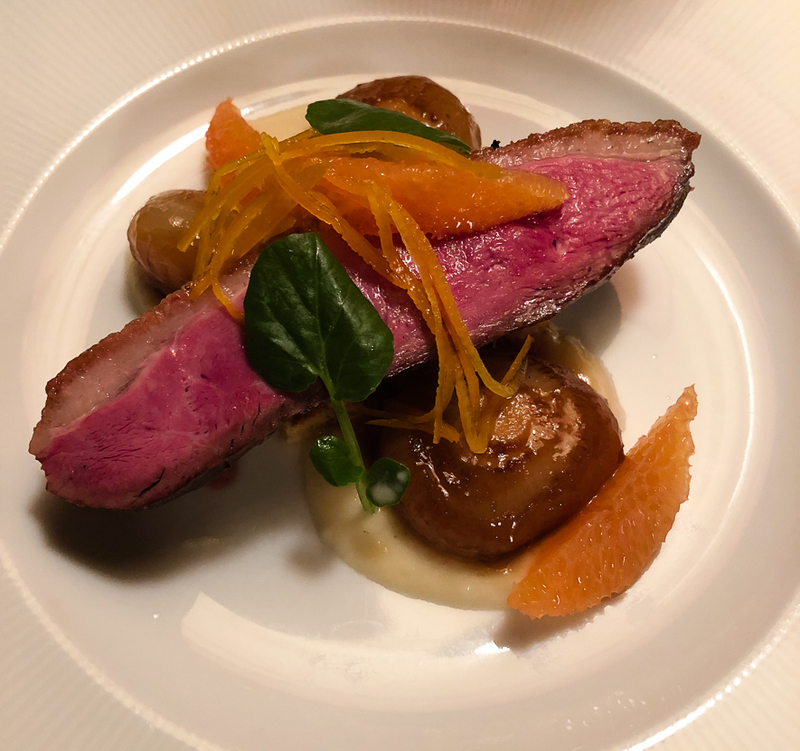 By the third and fourth courses I was wondering how they were going to keep getting better, since everything to this point was perfect in terms of temperature, flavor, plating, etc. 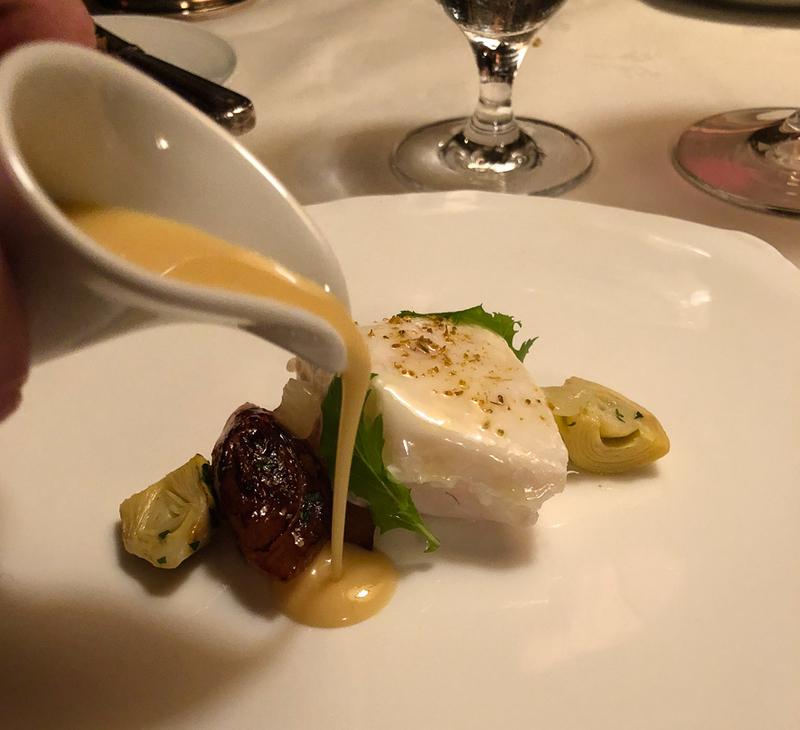 For the third course I had the butter poached halibut with caramelized fennel and a lemony sauce they pour on at the table, and for the fourth course I splurged for the duck breast. I was blown away by the presentation on this one. 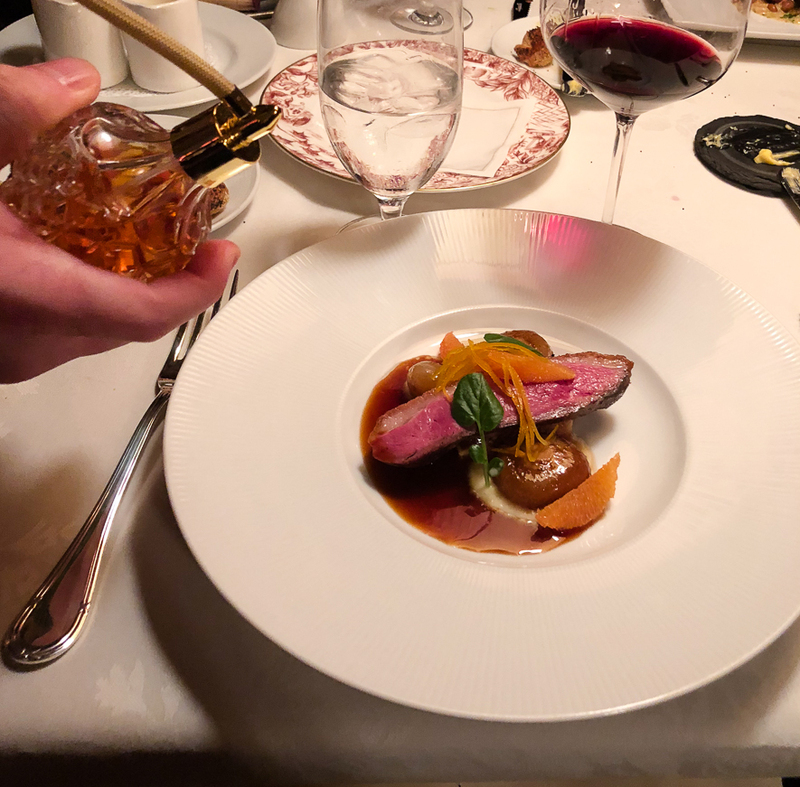 Not only do they pour a demi-glace sauce over the dish right as it’s placed in front of you, but your waiter then uses an old fashioned perfume bottle to spritz “orange essence” aka Grand Marnier over the dish! 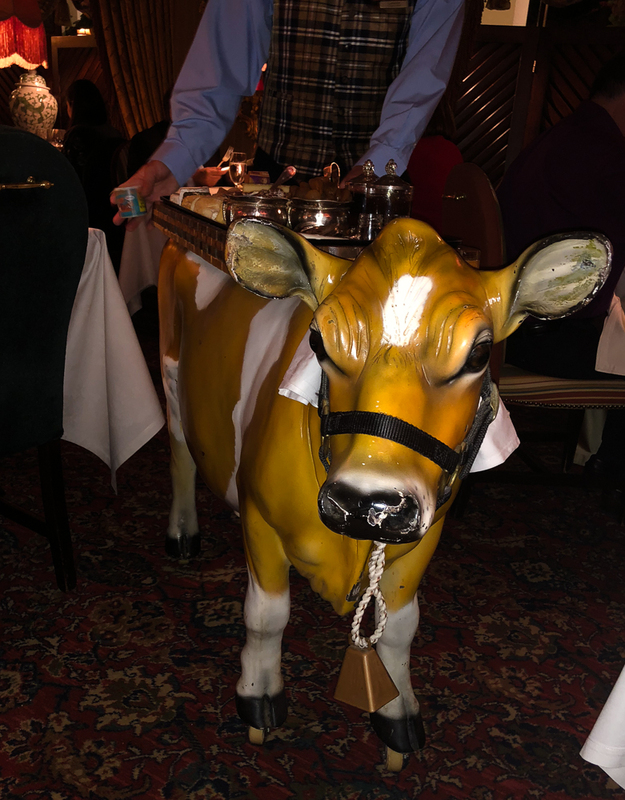 Another one of our favorite parts of the meal was the cheese cart that’s made to look like an actual cow. Her name is Faira, and she’s pushed around the restaurant by Cameron, the resident “Cheese Whiz”. Cameron was absolutely hilarious, and made many cheesy jokes as he recommended different fromages. Dessert was of course amazing as well. Not only do they do amuse bouches in the beginning of the meal, but you also get a pre-dessert course as well. Yes, you heard that right. I’m totally stealing that idea and making pre-dessert a thing from here on out. For the actual dessert course we had a Meyer lemon tart with blackberry citrus frozen yogurt, as well as a butter pecan ice cream sandwich with hot caramel and bittersweet chocolate. I think at this point I’ve run out of food related adjectives, and you can probably guess how I would describe the final parts of the meal. We ended our night in a way I’ll never forget. 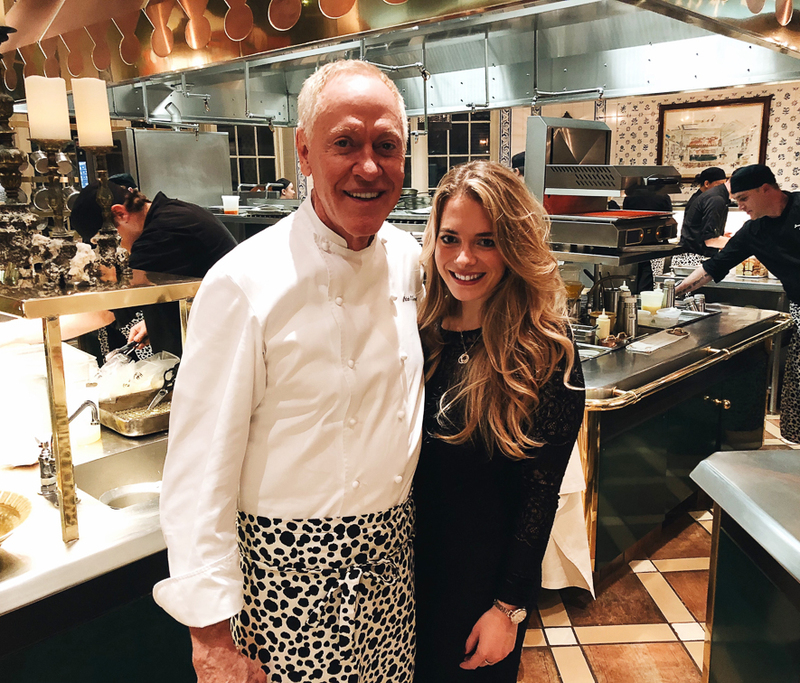 My dad nicely asked our waiter for a kitchen tour, so once we settled up we were led into the most magnificent kitchen I’ve ever seen. 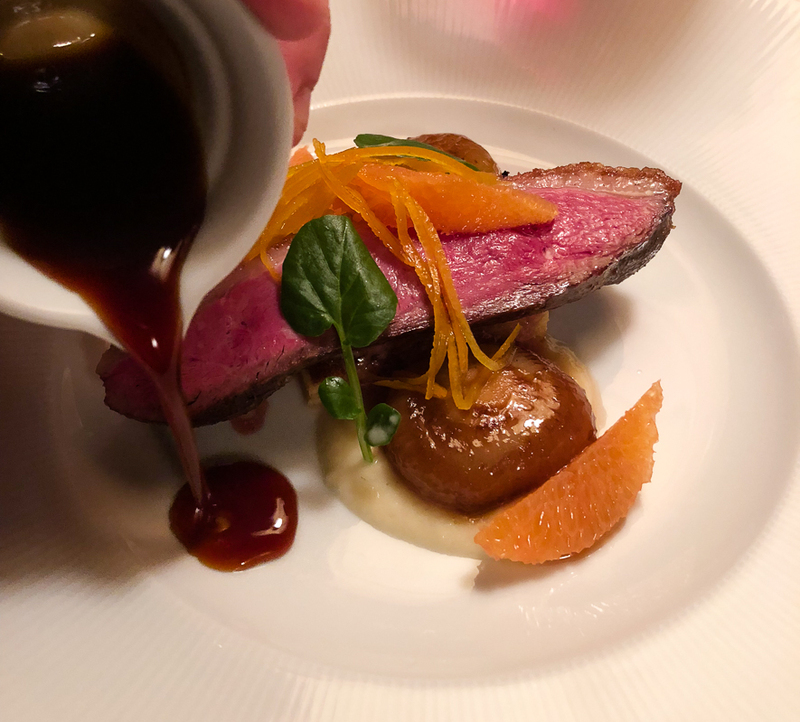 Copper gleamed, chefs were sous vide-ing, and I totally fangirled over Chef Patrick O’Connell. He was so kind and took a few pictures with my family and I, and can *clap* we *clap* talk about that leopard apron?!? Needless to say, I’m obsessed. I was so sad for the evening to come to an end, but as we drove out of Little Washington we noticed how bright the stars were without any light pollution nearby. We pulled over onto a tiny gravelly side road, and sat for a minute (as full as I’ve ever been) and just stared at the stars. I’d highly recommend ending your evening the same way. 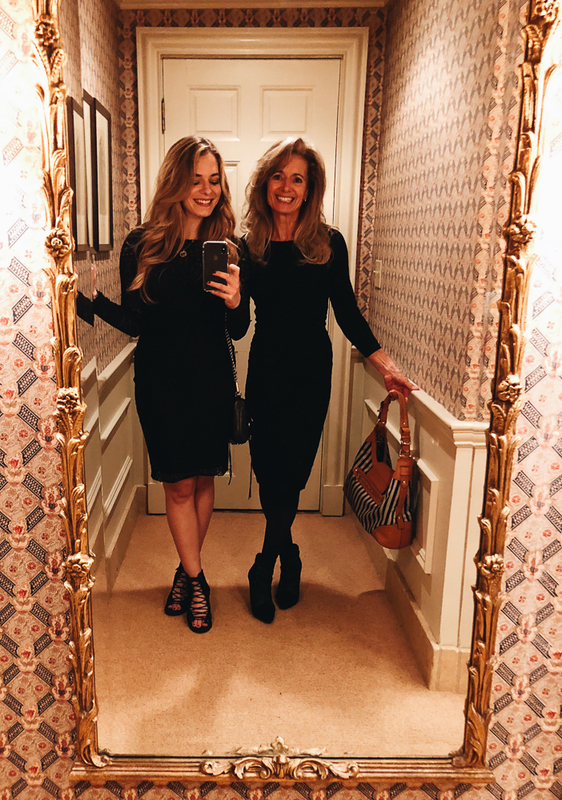 The Inn at Little Washington stole my heart, and I can only hope to one day come back and dine there again! Do us all a favor and treat yourself, I promise it’s worth it. Yum… wow! I may need to make a special trip! 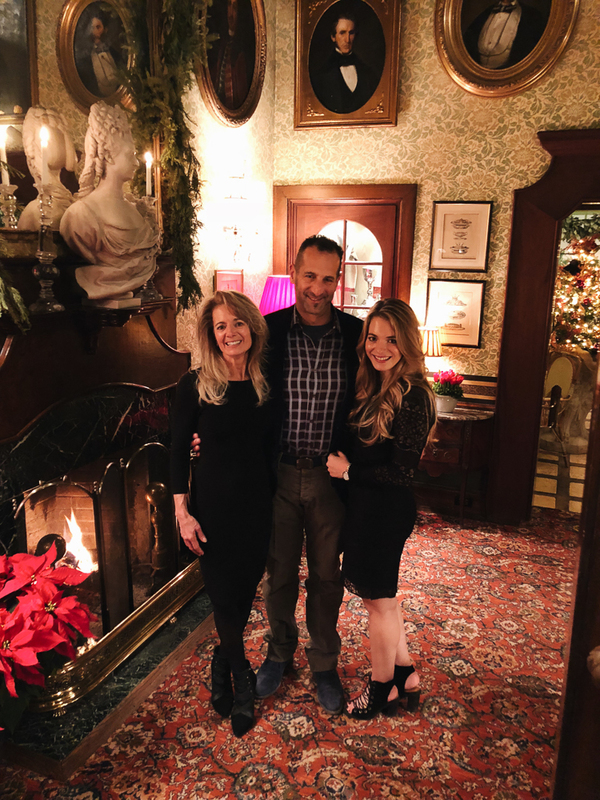 Great story and incredible job describing… the incredible job they do at the little Inn. Thanks for the invite in person and on paper !